Friends recently came across an aerial image of their 18th century cottage garden in the 1970’s and were slightly surprised to see that their now teeming, modest patch had temporarily been a featureless bare lawn with no borders or hedges, just low link fencing. Even when they moved in a few years back, there were but a few small, unexciting shrubs shyly skirting the space. They proceeded to plant a dwarf Cherry tree, added more border depth, let the lawn do its thing (encouraging clover and daisies) and steadily planted a heady, generous blend of bee and butterfly friendly perennials, annuals and climbers. The height, privacy and bushiness of the garden has since created its own micro-climate, significantly cooler and moisture retentive in the long hot days of 2018’s heatwave. When we recently sat out in it with them, swallows screeched above, high on the rising insect feast. Whilst it can take a few years to develop such a wildlife-rich habitat from the bare bones and for sheltering hedges and trees to gain height and width, new-build and ‘start-again’ gardens can benefit hugely from the artificial leg-up of some long-lasting metal wall trellis and/or trellis fencing. Fast-growing climbing plants will quickly fill out, providing food and cover for wild birds, insects and small mammals such as hedgehogs. At the outset, it’s best to discount any notion of looking for limited lifespan, wooden trellis. We wouldn’t wish on anyone the disappointment of untangling mature, well-loved climbers from collapsed rotten lattice or, possibly worse, perished plastic. Garden Requisites’ zinc-galvanised handmade wirework trellis will last a lifetime, most probably two, maybe even three lifetimes! Our trellis comes in a few differing forms – shaped wall and fence panels as well as wall-top trellis panels – which means that, along with other complementing garden structures such as gates, arches, even gazebos, there can be a pleasing sense of continuity through the garden. Varied finishes can also stylishly set off surrounding building materials. For instance, the ‘light bark’ painted finish is particularly smart alongside our local light-hued Bath stone. Delivery and the fixings provided are straightforward with plenty of advice on the website and on hand in person from Hilary and team. Strength and safety are top priority and freestanding fence panels are attached to unobtrusive, flat bar, solid steel posts. For awkward spaces, the trellis panels can also be made to order. This is so often music to our client Garden Designers’ ears! 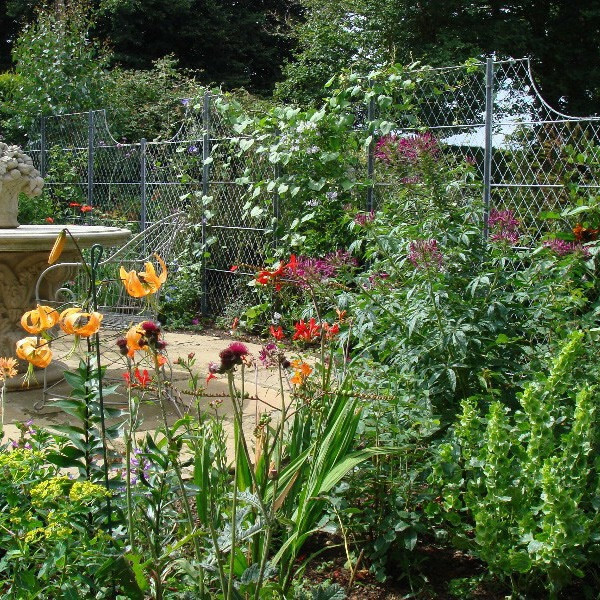 As well as lining garden boundaries with areas of trellis wall panels or installing freestanding fencing there, do consider dividing longer gardens into more manageable smaller zones that can serve different purposes, say for outdoor cooking, quiet time or play. Garden Requisites Trellis Troughs can also be speedy solutions for boxing off a terrace or patio area and mini climbers can be set off beautifully, under planted with Buxus (Box) shapes. In turn, local wildlife will benefit from added planting and privacy. Once the metal structures are in place, there are a multitude of climbers to choose from. First, find out if they are fast or slow-growing and which aspect they most prefer – full sun, semi-shade or shade? Jasmine is a lovely addition to any garden and one of Hilary’s favourite woody evergreens is the jasmin-esque Trachelospermum jasminoides or Star jasmine – happy to romp away in sunny, sheltered spots in milder regions of the UK. Climbing and rambling roses can provide nutritious rosehips for birds in the autumn & winter and the scent of bee-friendly honeysuckles is just delicious, delicately confined on warm evenings in that (wo)man-made micro-climate. For more trellis planting inspo, do head over to our colourful Spring/Summer Trellis Planting pinterest board – a treasure trove of towering twiners! Have fun choosing and getting your new climbers in position. No doubt you’ll soon be raising a glass of the good stuff, surrounded by birdsong and the soothing scents of Honeysuckle, Roses and Jasmine!